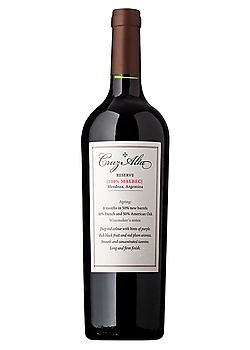 The 2009 Cruz Alta reserve malbec is a very welcome reprieve from today’s California reds. It tastes real. Fresh. Juicy but deep and dark, and not too sweet. A perfect touch of oak. On the heavier side of medium-bodied, with plum, black cherry, with a hint of cranberry. I love this wine! Unfortunately, the 2012 is what I am seeing on shelves these days. The 2012 vintage is not very good – weak, lighter-bodied than the 2009, too green, too acidic, and just “blah”. I tried, but I could not finish my bottle. It is sitting here, staring at me.